OSWEGO – The Oswego Bookmobile Book Auction Fundraiser starts this today (Sept. 19) at 7 p.m. This auction features autographed, children’s and young adult books with one book, ‘Naughty Mabel’ by actor Nathan Lane. 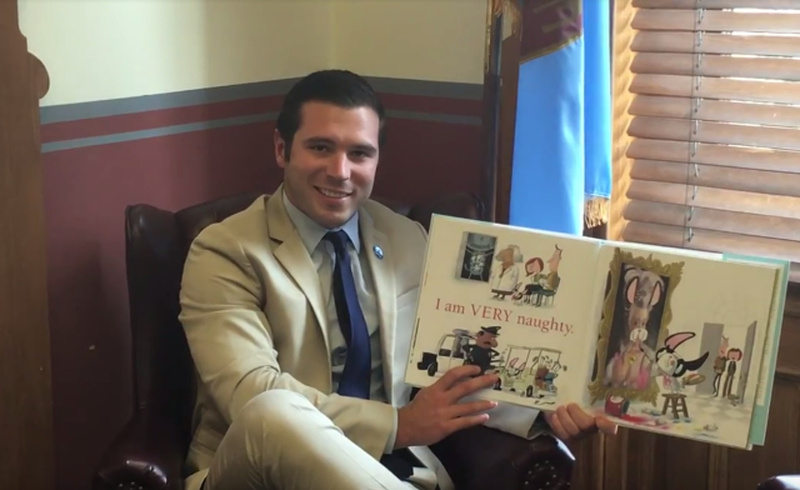 Oswego Mayor Billy Barlow reads from Naughty Mabel by Nathan Lane. The book auction is only the second organized public fundraiser for Oswego Bookmobile, in order to gather funding for their summer program. The auction will run through next Sept. 25 ending at 8 p.m. The auction can be found on OswegoBookmobile.com under the auction tab in the menu bar. The Oswego Bookmobile was founded in 2011 to combat an alarming trend. Testing indicates that economically disadvantaged children in the Oswego City School District are significantly less proficient in reading than their more affluent peers. By eighth grade there is a 40% gap between the percentage of economically disadvantaged children who are proficient in reading and the percentage of their peers who are proficient. This is due, in large part, to having limited access to books at their reading level in their homes and in their neighborhoods during summer months. This trend is commonly referred to as the “summer reading slide” and has a significant, long term impact on the academic success of children. To combat this deficiency, the Oswego Bookmobile drives to areas with the highest concentration of children from low-income families in the city of Oswego, town of Oswego and town of Scriba for seven weeks during summer vacation. The bookmobile provides youth with opportunities to participate in book selection at their independent reading levels and to own personal libraries of books they love. The program focuses its resources on children in low-income families who are most impacted by loss of reading skills when school is not in session. Without books, at-risk children rarely read during the summer and they suffer setbacks in academic achievement as a result. The Oswego Bookmobile is truly a community endeavor – a collaboration of Oswego Public Library, Oswego City School District, SUNY Oswego, iHeartOswego and a dedicated volunteer board of directors. Fifty-two percent of its budget comes from in-kind donations from its partners and the community.